As (1) Top Secret Writers reported in 2011, before the creation of the CIA, the United States’ government relied on the Office of Strategic Services (OSS) for the coordination of military missions during World War II. The OSS was responsible for creating a whole range of spy equipment designed to trick and kill the enemy. Though it wasn’t just the OSS caught up in designed deadly spy gadgets. Just when you thought James Bond’s spy gadgets couldn’t get deadlier, these real-life instruments used by intelligence agents around the world are enough to give Q a run for his money! When it comes to deadly spy weapons, the North Koreans don’t hold back! North Korea’s (2) spy flashlights come with a deadly twist. They comprise of three holes, each of which is a gun barrel. With the click of a button, the barrel is activated, wiping out enemies that are stood in the flashlights’ way! What could be more ingenious than a stunning Russian who pulls out a lipstick to touch up her lips and seduce American males, only to shot them dead by firing a bullet out of the lipstick? Referred to by the KGB as the ‘Kiss of Death’, these lethal guns disguised as an ordinary lipstick would be loaded with a single 4.55mm bullet. According to a (3) report on Crave Online, the Communists would send female spies abroad armed with these ‘Kiss of Death’ devices to shoot the enemy. 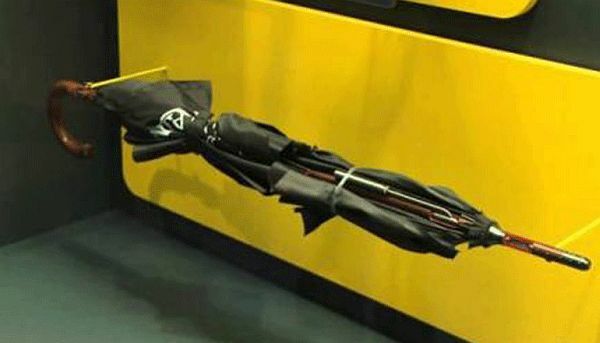 A dart gun disguised as an umbrella was used for the assassination of Georgi Markov, a Bulgarian dissident and writer. The (4) story goes that as Markov was walking down a street in London, he felt something in his leg. The Bulgarian soon became ill and died the next day from a micro-dart containing the deadly poison ricin, which was used inside the darts of the lethal ‘Bulgarian Umbrella’. Rats stuffed with explosives is a scene only the most imaginative of movie directors could think up! Though in World War II, the British intelligence attempted to curb the advancing Nazis by stuffing rat skins with explosive plastic and placing the corpses into coal supplies. However, the ingenious rat coverup was foiled when the Germans seized the first shipment of rats! How could a tiny keychain ever be a pistol? The Bulgarian Secret Service found a way, inventing these tiny weapons, which comprised of either a single .32 calibre bullet or compressed shell gas. 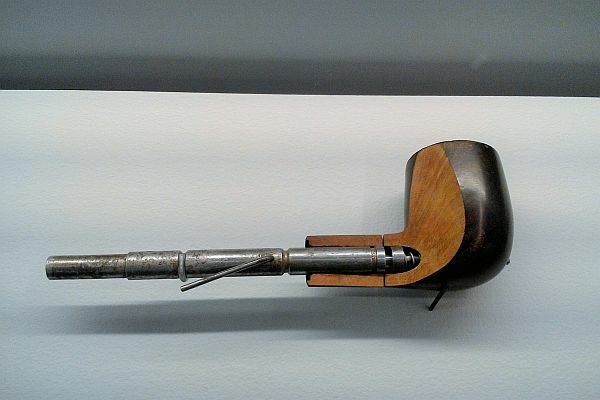 Who would ever imagine a gentleman smoking a pipe could actually be holding a smoking gun? The Pipe Gun was used by both Russian and American intelligent agencies to trick and kill the enemy. These deadly devices were capable of delivering single .22 calibre bullets. The bullets would be activated by twisting the end of the pipe. The Mobile Phone Gun is a comparatively newer deadly spy device. Despite nobody really knowing who invented this killer device, it created excitement in Europe several years ago, when it was discovered. At a glance, the Mobile Phone Gun resembles an ordinary mobile phone, albeit a bulky one nobody would be seen twice with! Though this is no conventional smart phone as inside there is a lethal .22 revolver loaded with a handful of bullets. Augmenting the ingenious nature of the device, the bullets can only be fired by pressing a four-number code. This one’s definitely got the hallmarks of an ingenious Bond-esque killer spy device! Made by the US navy, the glove pistol was a gun disguised as a glove, which was used to fire at the enemy when the plunger was pushed. The Glove Pistol were used in World War II. Known as the Sedgley OSS .38, this heavy-duty glove would have a single-shot gun built into the palm of the glove. Another gadget you would not expect could have the capacity to kill you is the Cigarette Case Dart Gun. This deadly instrument was, once again, invented by the Communists. In 1954, a Commie spy called Nikolai Khokhlov was sent to Germany with the mission of assassinating an anti-Commie dissenter. The story goes that Khoklov got cold feet and handed the device he was sent with to carry out the assassination over to the enemy. This thoroughly unique and deadly spy gadget looked like an ordinary cigarette case but was equipped with a tiny, electronically-powered gun. The firearm shot darts tipped in poisonous cyanide from fake cigarettes.